Clarke County is how Harry Reid stole every election. Unions and illegals and casinos, in other words, money laundering. And these people are fed up with it all! PAHRUMP, Nevada—A group of Nevada activists announced on Jan. 21 their independence from the current state, in the effort to break the rural counties away and form a new state called New Nevada. The activists in the New Nevada state movement are hoping to break all 15 rural counties away from Nevada. If the movement is successful, Clark County will be the only county remaining in the current state. Las Vegas belongs to Clark County. Nevada in 2017 had an estimated population of 3 million, while Clark County had 2.2 million people. 1. The rural areas of Nevada have not been properly represented by the current State Legislature. The Nevada State government has enacted regulations, such as “the infamous Commerce Tax,” against the will of the residents living in the rural areas. 2. The State’s one-party control Legislature wants to enact sanctuary state policy, restrictions against the second amendment, and more and higher taxes. 3. The current State Legislature has failed to provide a republican form of government, as guaranteed by Article IV, Section 4 of the US Constitution. The activists in the event all wore yellow vests. Thomas explained that their actions were in solidarity of French citizens’ movement against socialism and globalism, and in solidarity of all people who love liberty. 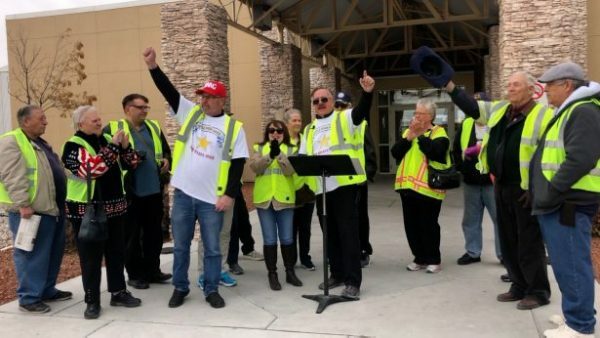 The activists in New California state movement have been wearing yellow vests since last December for the same reasons. Both movements attempt to follow the same Constitutional process in which West Virginia broke away from Virginia in 1861. “This is a historical Constitutional movement across the nation,” said Dane Senser, an activist who came to support the event from California. Senser was one of the leading figures in the New California state movement. Senser said there are now at least four other states in the United States with similar movements. Might make moving to Nevada worth while. These people don't seem to understand that there is actually a much easier way to become sovereign from the US and the state but still be American citizens. They aught to read up on the Indian Gambling Regulatory Act of 1988. This tied with other very loose laws on the books of the US Interior Dept would shock you. Every single Indian Reservation is a sovereing entity from the US. Every person is supported by us the US taxpayer. They pay no taxes, federal or state. They don't need to tax themselves because everything they do is subsidized by the federal government. The governing councils are wholly independent from any other government. What is happening is that anyone with native blood can file recognition with the Interior Department, this can be as few as 2 or three people. They can claim any land that was once controlled by native Americans. Once recognized they can also file for a casino. Nothing of the casinos is taxable, and if the governing council decides not to dispense this wealth with the other people living on this reservation, it is their doing. All this is quite appalling to me, but the fact that they are American Citizens and can vote in any election is why some of those debased politicians can be elected simply by working with Indian Tribes and get the federal government to grant Casino rights. Washington state is being similarly divided up. Currently they have about 30 Indian reservations and all of them are sizable in land, but each has at least on casino with the right to have up to three per reservation. You can see why people are objecting in these states since all products and services are all tax free. Restaurants can serve cheaper meals than those of a suburban area or city that lies within the Reservation. They are islands within the reservation. I'd love to see them take this approach. It's never been done before and there are no laws against it, so it would be a hoot watching the Establishment pee themselves while trying to find loopholes forbidding it. It would be very easy to overturn the Regulatory Act of 1988. The democrats passed it then mostly, so I don't think they would want to recend it. The danger is that one does not need to be of Indian blood to reside in a reservation. In fact, all the reservations in the US, has only about 20% Indians living on them. All the others are other American citizens. The real hazard is that Muslims could move to all of these areas, take them over, and have the grand life in the US. Get everything paid by tbe Federal govnment, pay no taxes and have their own court systm, namely Shuria law. Reservations are autonomous and independent. I've no doubt if Nevada were able to pull this off, it would be the last time it would happen, because Congress would be forced to close the loopholes, in hopes of forcing others to follow the law as it stands if the want to cede. My state,,, Nor Cal is using another approach over lack of representation and has a good chance of winning, I hope. Congress won't change it. It has become part of Agenda 21 of the United Nations. Part of that plan is to remove people from rural areas, create large green spaces. People will be consolidated into city centers. This Agenda has been implemented by all Presidents since Bush 41. I don't even know if Trump is even aware of this deep state disintegration of the US. I know of Nevada and California. Which are the other two? New york?